The word Kavvanah is derived from the Hebrew and basically means mystical attention, and a heightened awareness in regard to esoteric and spiritual practices. This practice was of special importance to the Kabbalists, who knew that in order to reach the higher spiritual realms, a heightened mindset must be attained and maintained. Another common definition of Kavvanah is as follows: A mystical instrument of the Jewish Kabbalists; a meditation that accompanies a ritual act, devotion, or inner concentration during prayer. Although the word Kavvanah is derived from the Hebrew, the practice itself should not be understood as an operation being confined to Judaism. In fact, the Kavvanah has its counterpart in most if not all religions, particularly in the esoteric adjuncts of the various religions. One of the primary goals of Kavvanah is to ensure a concentration of the senses toward a single target, or in other words to bring about an intense focus on the spiritual work at hand, whether it be a religious service, initiation, ritual or even could be used to intensify an initiate's private work in their home oratory. Many Martinists actually practice some sort of Kavvanah in their activities, though perhaps not aware of the antiquity of this practice in both Eastern and Western religions. The purpose of this present study will be to demonstrate the need for Kavvanah in Martinist work and to explore possible methods and advantages of its use. Unfortunately, most Martinist Lodges and Heptads do not enjoy the luxury of owning their own buildings for use as a Temple. So this, in turn, means that the officers are often forced to set up and dismantle the Temple for each occasion. With this added task, the activities may become rushed and any attempt of the officers or members to properly prepare their consciousness for the intensity of the ensuing ritual and its interaction with the egregore may be cut short or even be non-existent. In order to experience the true spirit of Martinism, we must, take a serious stance which includes being in a proper state of mind before the work begins. The first matter at hand then would be to consider what activities may be utilized in producing a Martinist Kavvanah for those about to enter the Temple. This process takes place in the antechamber with all officers and members present. Obviously, the first act should be a short but effective prayer. This prayer need not be a long and pre-written prayer, but rather an imploring of God to assist us in our operations and help us to attune to the egregore. After the short prayer, the brethren should continue with a short meditation. Although a Kavvanah could be performed within say ten minutes, a great deal may be accomplished in this time period. We will now examine some of the individual components of the Kavvanah, although only a few examples will be given and this is certainly not to be considered an all inclusive list . One possible scenario would be to appoint one of the brethren to lead a short guided meditation highlighting what is hoped to be accomplished in the forthcoming ritual, with slight pauses between statements. The latter portion of the meditation should be pure silence in order to allow the higher and lower aspects to merge. With this in mind, the perfect symbol for this portion of the meditation would be the Martinist Pantacle. 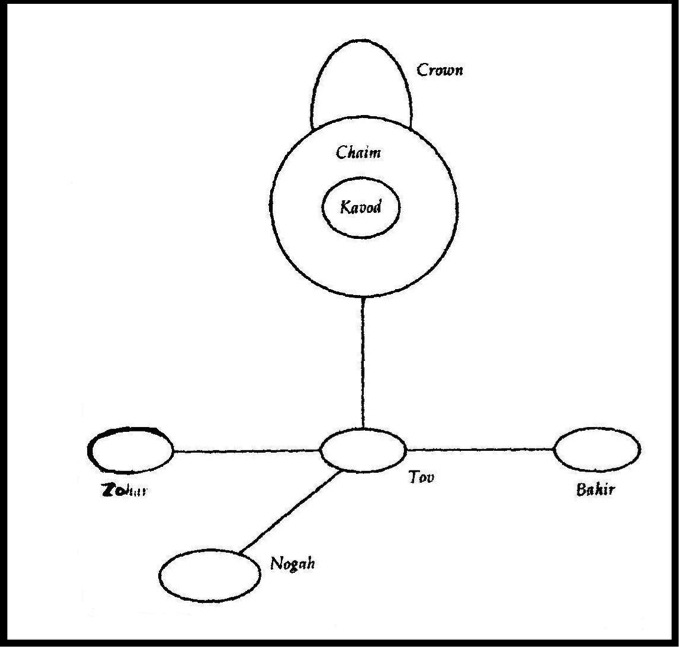 The following is another example of Kavvanah that is adapted from the Kabbalah. This method teaches us that when a person or group sets their mind on something with every bit of energy that can be mustered, then the essence of the desired effect will eventually return to the practitioner. One way that this is realized is through our chain of union, where manifestations of the egregore occur. First, visualize yourself as a pure light being, and furthermore imagine that all of your surroundings are also made up of light, signifying the Holy Sparks that secretly reside within all things. In the middle of the room there is a light that is actually a throne of light. Above the throne is a light called Nogah (glow). There is now another throne facing the first one, and above this second throne is a light called Tov (good). Now try to see your own light standing between the two thrones. Realize that the light of Nogah represents judgement, and the light of Tov represents mercy. Facing Tov, with Nogah behind you, turn to the right and there will be another light called Bahir (brilliant). Turning back to the left of Tov, you will find another light called Zohar (radiant). ​​Above these two, directly between them, is a light known as Kavod (glory). Around it is a light called Chaim (life), and above it is the crown. This is the light that crowns the desires of the earthly initiates who are working solely toward the glory of God, and it is also the light that illumines their paths to aid them in the navigation of the celestial realms, and lastly it enhances the radiance of their vision. When we truly become men and women of desire a veil is removed between us and the crown. Saint-Martin tells us, "In fact, he (man) may obtain that the Divine Will itself come in him, to join his desire; he may then work and act in concert with Divinity, who thus condescends, in a manner, to share His work, His properties, and His powers with man: and if, in giving him desire, which is as the root of the plant, He reserves the will, which is as its bud or flower, it is not to the intent that he should remain deprived of this Divine Will, and not know it; but, on the contrary, His wish is that he should ask for it, know it, and do it himself; for, if man is the plant, God is the sap or life. And what would become of the tree if the sap did not run in its veins?" The following are two examples of personal Kavvanah as given in Rabbi David Cooper in his book, God is a Verb. 1. Sit very quietly and notice the experience of the body, the feeling of the chest rising and falling. Whenever you notice you are thinking about other things, stop what you are doing, take a couple of deep breaths, and come back to the experience of the body. When you know you are centered, continue with the exercise. 2. Allow yourself to appreciate being here right now, saying to yourself something like: I am aware. I am free to make choices in life. I am a whole person, and I am thankful for being alive. Notice your awareness, your sense of wholeness, and how your feeling of thankfulness expresses itself. 3. Now, let yourself focus on your mind, what it does for you, how it works, and its potential. Whisper to yourself something like: I am grateful to have the ability to see things, to understand, to notice light from dark, truth from falsehood. My mind works, and I am grateful for having insight. Notice this mind and be grateful for its capacity. 4. Now, let yourself focus on your body. Many of us have poor body images. This is not the time to be body-critical, but rather to be body-positive. Think of the body in its wholeness; be aware of its strengths. Examine the parts that are in good working order. There are thousands of parts that are functioning well, and perhaps a few that am not. Offer thankfulness for the parts that are working. 5. Stand up and walk across the room. Notice as many movements as you can in the process of walking. How does it feel to lift: and move your body? Try to notice the ankles, knees, hips, thighs, the feel of clothing on your skin. Notice how the shoulders, arms, back, neck, and head move while walking. Go as slowly as you wish. During this time, give thanks for the ability to move and to feel the movement. Give thanks for each part of the body that does its job while you move. 6. Return to your seat and sit down again. Keep your eyes open and look straight ahead without moving your eyes or your head. How much can you be aware of seeing without moving? Notice that you try to identify and put names to the things that you see. Try simply to notice shapes, colors, shadows, and movement without naming. Notice any sounds that are occurring. Try not to dwell in a sound, but to be aware of each new sound in every moment. Give thanks for the ability to notice so many things and that life can be so full. 7. Now, simply sit quietly and notice everything that happens in each moment, to the best of your ability. You will discover that when the mind is active, you will not be able to remain as aware. Whenever you realize that the mind is thinking, pulling you out of your physical awareness, gently come back to the experience of the body. In time you will be able to observe your thoughts without being overwhelmed by them. Once again, give thanks for the wonderful gift of awareness and the richness of life in each moment. 8. If you do not already have one, get an inexpensive watch that has a timer. Set the timer for approximately, but not exactly, one hour. Throughout the day, whenever the timer beeps, stop what you are doing as soon as possible and take ten to twenty seconds to conduct a body scan; be aware of what is happening in your own body and around you. You can do this even while you are engaged in another activity. Simply notice where you are, how you are feeling, what is happening in different parts of the body, what sounds are occurring, and your general visual experience. Each time you do this, give thanks for the fullness of the moment, your awareness, and the abundance of life around you. 9. Every few days, change the time by a few minutes so that this meditation never becomes a routine. Soon you will become aware of things spontaneously, without the timer, and your perspective will begin to change. In a matter of a few weeks, you will begin to notice the difference and will be much more present in your body. Being present adds an entirely new dimension to life. 1. Sitting quietly with your eyes open, trying to be very stiff, allow yourself to think about a simple physical movement, like turning the page of a book, reaching to pick something up, scratching an itch, but don't move. Simply notice what you want to do, but don't do it. 2. Be aware of the tension of wanting but resisting. At some point you will do something, but do not do it just yet. Your mental task is to observe exactly what must happen in order for your desire to overcome your resistance not to move. Sooner or later you will allow yourself to reach for the book or turn the page. While you are waiting, what thoughts go through your mind; what does it take to get the body moving? 3. At the precise moment you begin to move your hand, are you able to observe your own will that draws you to a particular movement? 4. Now, imagine that every aspect of existence is connected to a power source. If any particular connection were to be cut, that piece of existence would instantly cease. Nothing can exist without being connected to its source. Now, imagining the presence of the source of life, that which empowers all movement, repeat steps 1 to 3 above. 5. When you are ready, reflect on everything around you from the perspective that the source of creation is constantly present. This source vitalizes every movement and attends every action, word, and thought. Experience this as the presence of the Divine. 6. Set the timer on your watch to go off every two hours or so. Each time it sounds, reflect on the presence of the Divine for as long as you are able to do so. This will become automatic. A major aspect of the enlightening process is bringing the presence of the Divine into as many moments of your life as possible. As in the previous exercise, in a few weeks you will begin to experience the change. Rabbi Cooper says of the first exercise, "being aware of every physical stimulus arising in each moment, is easy to describe but difficult to master". Much progress is often made in the early stages, but it is difficult to sustain the required concentration, and we easily fall back into old patterns. Although this method may sound simple, it is actually an advanced method similar to those found in other traditions such as Zen Buddhism. The second exercise is also difficult to maintain. Rabbi Cooper's elaboration's on this exercise are as follows: "This exercise heightens the sense of immediacy of the source of life in everything that unfolds and then slowly melts barriers of self-identity which keep us believing we are separate. Once we fully realize the degree to which we are integrated into the spectrum of awareness--that is, that we are part of it--our perspective of life changes dramatically". By practicing Kavvanah we come to the realization that the physical universe is measured in time and space, but the spiritual universe is measured by levels of awareness. The important point to be aware of in the latter is that awareness is a continuum. To quote Rabbi Cooper once again: "The worlds of awareness integrate along a continuum. Each has parts of the others that cannot be separated. Just as a musical note has a common vibratory frequency no matter how loud or soft, the Kabbalistic Universes share the common medium of awareness". The Kavvanah is but only one aspect of the pathway of ascent to God, and the only real obstacle standing in the way of the soul is the mind. The mind is the power that is primarily responsible for the division (apparent or illusory) of Oneness into the many forms and manifestations that we experience in the physical world. The mind then can be a double-edged sword, an agent of constant interruption and disruption during our meditations and spiritual activities, or it can be a tool in which to build with. In the first case, the mind acts as a demiurgic ego that will throw every obstacle imaginable into our path, to keep us imprisoned in the physical realm. In the second case, we can use the mind to our benefit by flooding it with nothing but positive thoughts, and envisioning ourselves as always rising on the path back home. The Kavvanah is not just a practice to be done just before rituals, but in effect should be a process that is going on at all times in our lives. 1) Meditation--this will eliminate the distractions that constantly flood our mind. This may also be thought of as a cleansing process, sort of a shower for the soul. 2) Introspection--this will allow for self-observation and reflection on our path up to the present. 3) Self-Realization--Eliphas Levi approaches this subject in his book, "The Paradoxes of the Highest Science": "Not to succumb to the unchangeable forces of nature, but to direct them; not to allow ourselves to be enslaved by them, but to make use of them to the benefit of immortal liberty; this is the great secret…But, for man to command the soul of the earth demands great knowledge, and great wisdom, or great exaltation". 4) Ascension to higher awareness (consciousness)--perhaps the most important aspect of the Kavvanah, the part of the process which elevates everything to a higher plane. I have had the great fortune of having been able to visit a number of Martinist Temples in the USA, Canada and the Caribbean. During these visits, I have always taken notice of the behavior of those in the antechamber, who are about to enter the temple for the opening. Some carry on in a normal casual fashion, talking and joking until the last moment. The officers often mumble among themselves, making sure that everyone knows their parts. And then there are a few who will retreat to a quiet corner for silent meditation and prayer, shutting out everything around them. It is also interesting to take note of the behavior of these same people as they exit the Temple after the closing. The ones that went in casually, will usually leave in the same mindset. The officers who were so nervous and jittery before entering, will almost immediately after the ritual, begin talking of any slip ups that may have occurred during the proceedings. However, the ones who were practicing some sort of Kavvanah back in the antechamber, will exit the Temple with a radiance about them, and they are also the ones who will tend to have a true mystical experience during the ritual. Many have stated that the chain of union in a particular Temple is only as strong as its weakest link, however, this should be clarified a bit to avoid any misunderstanding. The weakest link in a Martinist chain is not necessarily the lowest in rank, but rather the one with the least intent and zeal for the true work at hand, which is the path of reintegration. "The soul reaches and enters the gateway of God, inwardly bowing in natural awe, worship and love. This is the true and spontaneous love and worship of the soul for God, having little or nothing to do with the set forms of worship and ritual we find in the temples, churches and other man-made buildings of this world".